Is Hyperbaric Oxygen Therapy for Alzheimer's Disease Effective? I am seeing an upturn in reports about a variety of less invasive or non-invasive treatments for Alzheimer’s disease. The lack of success of drug trials may be partly responsible. Here is a potential one that uses the therapy used to treat divers with decompression sickness (the bends). Investigators in a resent study used hyperbaric oxygen therapy for Alzheimer’s to treat a women whose pathology was progressing rapidly. What Is Hyperbaric Oxygen Therapy for Alzheimer’s? Hyperbaric oxygen therapy (HBOT) introduces pure oxygen into the lungs under pressure. This increases the amount of oxygen available to damaged tissue and promotes healing. 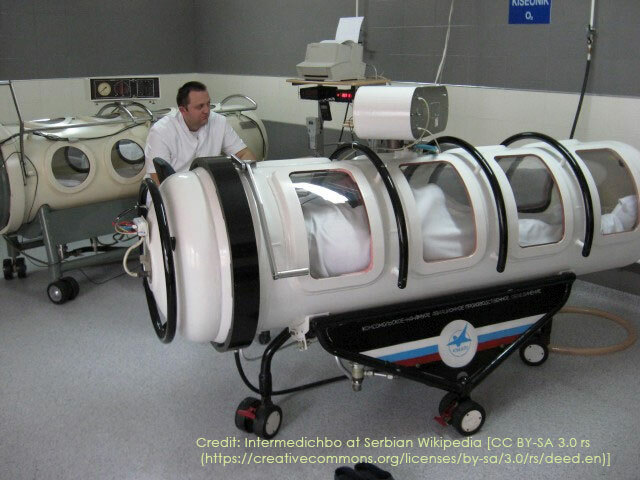 Although hyperbaric oxygen therapy is best recognized as a treatment for a hazard of scuba diving, it is used to treat a host of other conditions and injuries. Included in this list are non-healing wounds and burns, skin and bone infection, and crushing injuries and gangrene. The study is a collusion between two researchers at different medical schools. Dr. Paul Harch is the director of Medicine at Louisiana State University (LSU) Health New Orleans School of Medicine. Dr. Edward Fogarty is chairman of Radiology at the University of North Dakota (UND) School of Medicine. A spokesman from Mayo Clinic rightly points out that more trials are necessary before anyone gets too excited about hyperbaric oxygen therapy for Alzheimer’s disease. The current study, published in January in the peer-reviewed journal Medical Gas Research, used HBOT to treat one subject with Alzheimer’s disease. Mayo Clinic is probably just exercising a healthy scientific reserve until more experimental evidence is available. Russia and China are both reporting success treating as many as 100 different conditions with HBOT. But Russia and China have fewer restrictions on research than does the United State. On the other hand, there are researchers in this country who are expanding the horizons for HBOT. For example, a 2013 study* published in the peer reviewed journal PLOS ONE reported significant anti-cancer effect when HBOT was combined with a ketogenic diet. So there is some evidence that this therapy might in the future be used to treat a broad range of conditions and diseases. M3 Biotechnology is now Athira Pharma. The Seattle-based company changed its name to more accurately reflect its “focus on developing regenerative therapies for Alzheimer’s, Parkinson’s and multiple sclerosis.” The word Athira comes from the Arabic word for “a force” or “an energy.” The company is currently testing its drug NDX-1017 on human subjects with dementia or mild cognitive impairment in the US and France. Unlike the plaque-busting drugs that have suffered so many setbacks in recent decades, Athira hopes theirs will restore lost connections in the brain, or stimulate the growth of new neurons. Scientists know that a type of younger onset Alzheimer’s disease, called familial Alzheimer’s, results from inherited mutations in one of three genes. Though this familial type accounts for as little as 2% to 3% of all cases of Alzheimer’s disease, some scientists believe that studying it may lead to a better understanding of the genetic link to the disease in general. Another gene called APOE is known to have a connection to later-onset Alzheimer’s disease. There are three types of this gene; APOE2, E3, and E4, and they influence risk in different ways. The rarest form is E2, and is thought to reduce the risk for Alzheimer’s by as much as 40%. E3 seems not to influence risk at all. The APOE4 version can increase risk by up to sixteen times. It also lowers the age of the disease’s onset. It is present in 10-15% of the population. So pervasive is the connection between the presence of this gene and the disease that the National Institute of Health recommends testing for it only in the case of clinical trials. Knowing that one has this gene can be very upsetting, as genetic makeup can’t be changed. At least it can’t be changed at this time. A team of researchers led by Ronald Crystal at Weill Cornell Medicine in New York is hoping to change that. The team plans to start a gene therapy trial in May. The subjects will be people who have tested positive for the APOE4 gene, and are at a high risk for developing the disease. The treatment will involve a high dose of the protective APOE2 gene. This is very experimental, but certainly worth watching. The Alzheimer Prevention Trials (APT) Webstudy is an online registry designed to accelerate enrollment for Alzheimer’s disease clinical trials by identifying and tracking individuals who may be at higher risk for developing Alzheimer’s dementia. After signing up, participants will go online to fill out a brief assessment of their cognitive abilities and complete a 20-minute test to assess their memory and thinking skills. The test will be repeated every 3 months, and participants will have access to their scores. To inquire about participation in the current Phase 1 clinical trials of NDX-1017, please contact 1-800-839-2095 or visit www.ndx-1017.com. In France, contact our clinical partner, Biotrial, at 0 800 503 460. Further details on the study can be found on clinicaltrials.gov. A little late to the party, Business Standard reported last week on the possible benefits of virgin coconut oil in Alzheimer’s prevention. More exciting news, at least for us coffee drinkers. Researchers have reported a connection between coffee consumption and a reduced risk of Alzheimer’s and Parkinson’s, but the mechanism at work was not understood. A group of researchers in Toronto hypothesized that the compounds in brewed coffee offer protection against the accumulation of proteins in the brain. That includes the plaques and tangles that are hallmarks of Alzheimer’s disease as well as α-synuclein, the protein associated with Parkinson’s disease. However, it may not be the caffeine. The researchers looked at 6 compounds found in coffee. These are caffeine, chlorogenic acid, quinic acid, caffeic acid, quercetin, and phenylindane. Some bad news for cola drinkers—caffeine by itself offered no protection against amyloid plaques or fibrillary tangles, or against α-synuclein. Phenylindane demonstrated the highest degree of protection, but the authors to posit a synergistic effect among several or all of the compounds.